While refinance applications seem to be taking a backseat to purchase applications, there are still some good reasons to refinance your mortgage, even if rates aren’t currently at their best. First off, let me preface this with the fact that mortgage rates are still spectacular. Yes, the 30-year fixed used to be in the mid-3% range, but a rate of around 4% was relatively unheard of until recently (and is still available today). Unfortunately, the recent increase in rates has dented refinance applications as the pool of eligible borrowers begins to dry up. Today, the Mortgage Bankers Association noted that refis slid another 4% in the latest week, pushing the refi share of total mortgage activity down to just 42.6% from 44% a week earlier. Most industry participants saw this coming, which explains the recent trend of mortgage companies cozying up with real estate agents. Hello Motto Mortgage and Redfin Mortgage, to name just a couple. But there are still opportunities for both homeowners and mortgage lenders to pick up the refi slack. One such opportunity is refinancing an FHA loan into a conventional loan (such as a Fannie Mae or Freddie Mac loan), the main benefit being the removal of the mortgage insurance that must be paid on the former. Thanks (or not thanks) to the FHA’s stringent mortgage insurance rules, the annual mortgage insurance premium (MIP) must be paid monthly regardless of whether the loan balance falls below 80% loan-to-value (LTV) unless the loan is a 15-year fixed or came with a 10%+ down payment. Or if it’s an older FHA loan. Most FHA loans are 30-year fixed mortgages with minimal down payments, meaning MIP often stays in-force for all 30 years unless you refinance out of the FHA. This adds to an otherwise low monthly mortgage payment, making even a great mortgage rate a little less attractive. Many folks took out FHA loans several years ago to take advantage of the low 3.5% down payment requirement, and because home prices have increased so much since then, some of these borrowers may have the necessary equity to refinance into a conventional loan at 80% LTV or less. Doing so will allow them to ditch the MIP and avoid PMI on the new conventional loan, which could equate to substantial savings. Instead of subjecting yourself to ~$200 in monthly mortgage insurance premiums, you might be able to refinance to a conventional loan at 80% LTV or less and rid yourself of that burden. Tip: Note that the Upfront Mortgage Insurance Premium (UFMIP) is non-refundable if you refinance out of the FHA to a conventional loan. It may be refundable if you refinance to a new FHA-insured mortgage. Not just anyone can take advantage of this type of refinance. Only those who have gained enough equity and who can obtain a comparable (or better) mortgage rate will win here. Using our example, the home must now be worth X amount to get that LTV down to where it needs to be. I say X because it depends how long you’ve had the loan. A combination of home price increases and the natural amortization of the loan will tell you what the value needs to be. The loan balance above would drop to $277,000 in just three years, requiring a house value of $346,250 to get the job done. Fortunately, home prices have surged in the past several years, so for many lucky borrowers the appreciation alone can push a relatively young loan to the magical 80% LTV mark upon refinancing. Assuming you’re good to go there, you’ll need to consider the mortgage rate. That is, your former mortgage rate and the refinance mortgage rate. If you previously had a rate of 3.75% on a 30-year fixed, and the best available rate today is 4.125%, you have to take into account that .375% bump in rate. The good news is that it shouldn’t affect the mortgage payment by too much. The old principal and mortgage payment was $1,322.73 plus $205.06 with MIP, making it $1,527.80 out the door (don’t forget taxes and insurance too!). If the rate were 4.125% instead, the monthly P&I payment would be (based on a slightly lower outstanding balance of $277,000) $1,342.48. Yes, it’s a bit higher than the old P&I payment, by around $20, but you no longer have to pay the $200 in MIP. That’s a significant amount of monthly savings. In reality, you might actually do even better if you started out with a higher mortgage rate thanks to a low credit score and/or high LTV, and have since improved upon those things. Check your current LTV to see if you can benefit too! CoreLogic recently noted that thanks to the FHA policy change of requiring mortgage insurance for life, FHA to conventional refinances have soared. Last year, such refis accounted for about 8% of all refinance transactions, with about 20,000 loans originated per month. 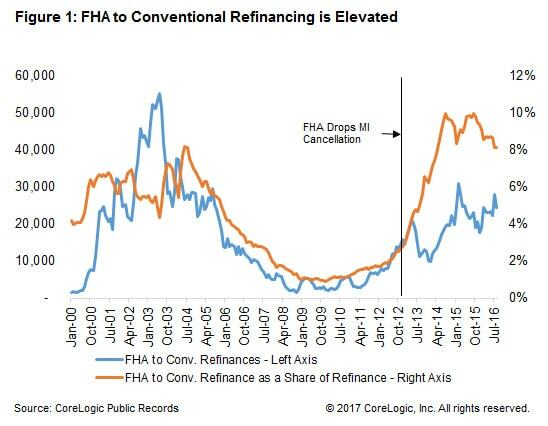 In 2010, that rate was about 4,000 FHA-to-conventional refis per month, or just one percent of refinance transactions. Since 2013, when the FHA’s mortgage insurance policy changed, about 2.9 million borrowers have taken out FHA loans. CoreLogic expects another 250,000 of these borrowers to go conventional in 2017, thanks in part to another 5% rise in home prices. If you’re currently in an FHA loan, it might be time to consider a conventional loan instead if you stand to save a decent chunk of money each month. Just be sure to take note of how long your FHA mortgage insurance will actually be in-force. Some borrowers with older FHA loans, 15-year fixed mortgages, or those who originally made large down payments might have more favorable insurance requirements.